Over the few years I’ve been creating content for this site I’ve spoken numerous times about the dangers involved with our sport and how things can go wrong. I’ve also spoken about how if our approach to rider improvement is a sensible one, we can get many track day miles under our belts without incident and see ourselves making a lot of progress without ever having to get acquainted with the asphalt. It is this sort of approach that meant I was able to go 6 years without parting company with my bike since my second crash very early on in my track life. Unfortunately, while we are able to account for our own actions on track, we can’t account for those around us. 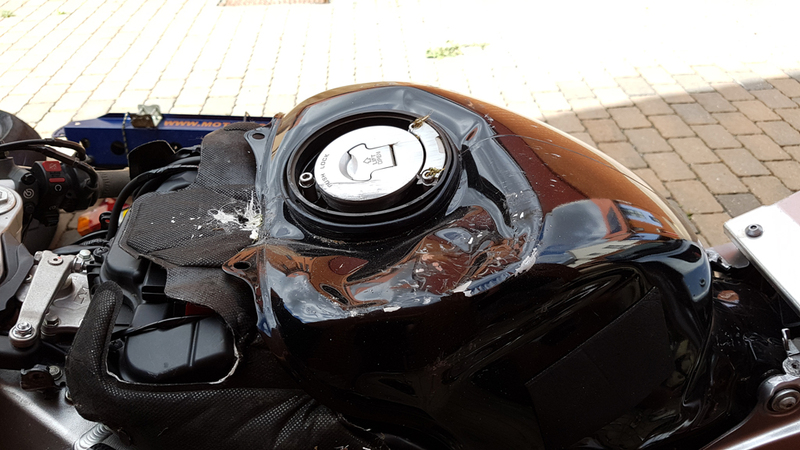 Having had a few close calls over the years stemming from misjudgements from both myself and other riders, this time it ended up being a bit too close. 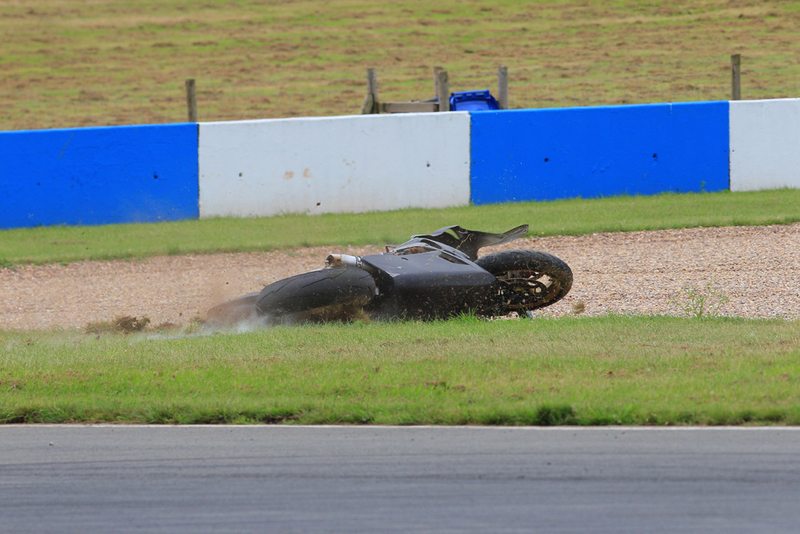 On the 1st August 2016 while riding at Donington Park in the first afternoon session after lunch I was the unfortunate party of such a misjudgement, with the end result not being a pleasant one. 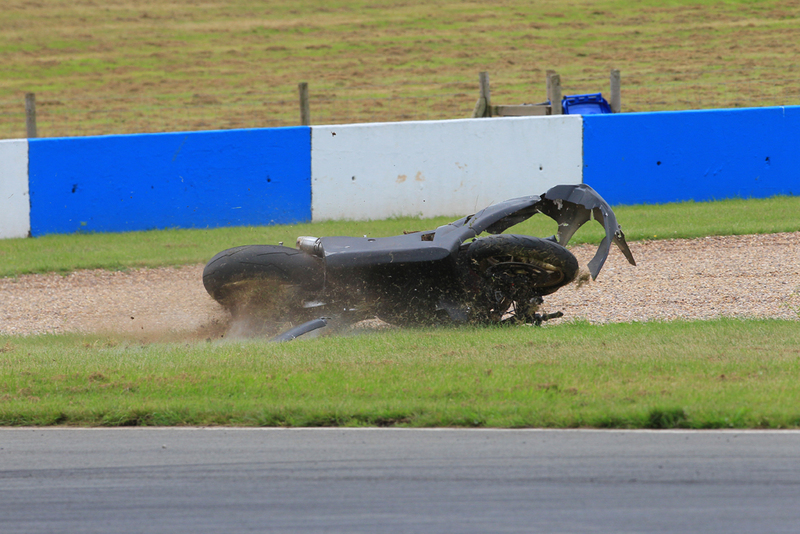 The simple explanation is that our bikes were heading for the same bit of track and they collided. 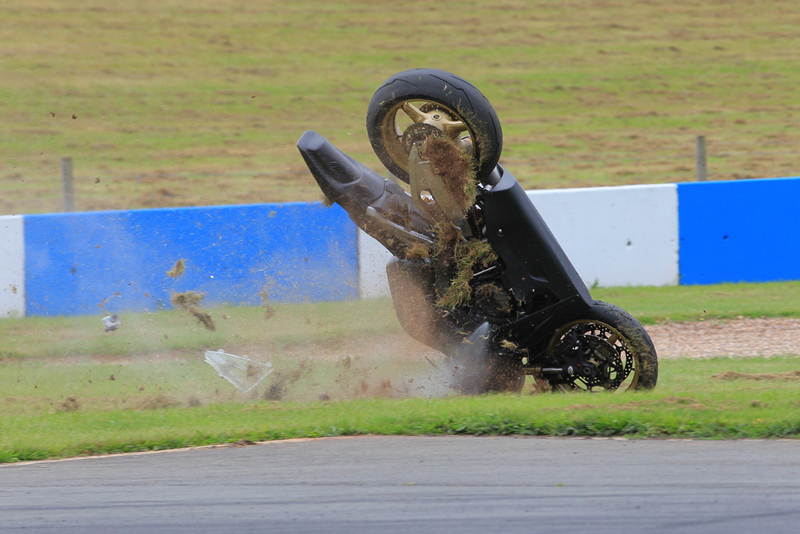 Having seen the footage and talking to the rider after, I feel that he was aiming to take a straight line from the right side of the track over to the left ready for the next corner. For me, due to the slight left kink in the track coming over the brow and the fact that when I hit the brakes the bike stands up, I drift over to the right and our paths cross. Could I Have Avoided the Crash? During the short time of this happening I distinctly remember the feeling that my options to avoid a collision were non-existent. While I saw the rider coming past in my peripheral vision, as you would, at a guess I would say I had about a second from realising that he was going to cross my path, to actually touching me. Maybe a little more. 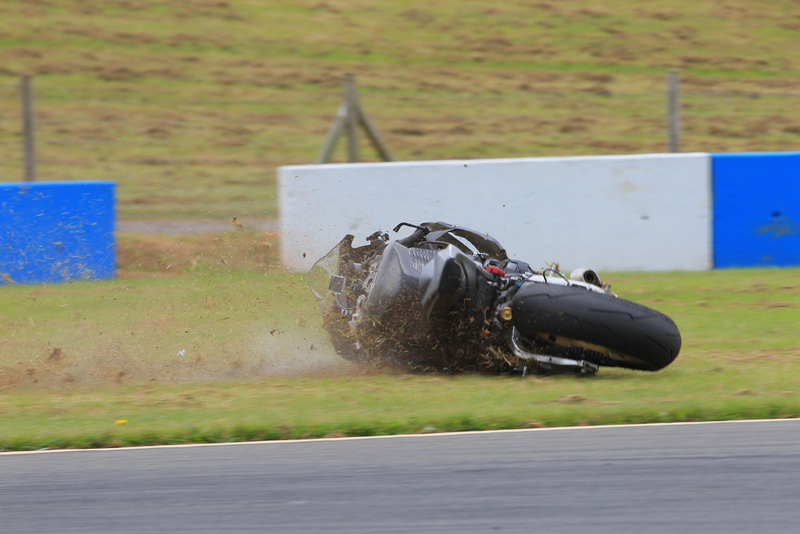 At this point I had just rolled off the gas to start my braking phase, and as anyone approaching a corner at 130mph needing to scrub off about 90mph will tell you, your number one priority at that time is getting the bike slowed down. A number of people have intimated that I could have perhaps moved/stayed left and had a chance of avoiding it, which I accept as a possibility. I do feel that by watching and re-watching slow motion footage of it, it’s not out of the question to come to that conclusion. I will also concede that in the final moments before contact I was simply a passenger waiting for it to happen where I was entirely fixated on the rider coming toward me. That being said, in real time and at high speeds where I’m moving into the most sensory rich part of track riding (high speed heavy braking) and the little time I had to react, I’m not sure I would get out of it the second time if you were to rewind the tape and give me another go. The rider following behind that came to find me after to tell me I had “no chance” kind of lends itself to my thoughts too. I actually wasn’t too upset or angry about it to be completely honest. It was a simple misjudgement of space and I fully accept that everyone makes mistakes from time to time, so getting angry about the situation really wasn’t going to help anything or anyone. The rider involved was actually in the same garage as me and we spoke about it after. He was seriously disturbed by what had happened and to his credit he did end up offering to help with repairs. I accept the risks I take when I head out there, so searching for or demanding retribution really wasn’t a thought. As for me physically, I got off extremely lightly having jumped off at 100mph+. I walked away without a single bump, bruise or scrape. I did have some immediate vision troubles having taken a sizeable whack to the back of the head, but other than that my body itself was completely unharmed, and after having check-ups and scans the next day my grey matter was confirmed as being a-okay too. 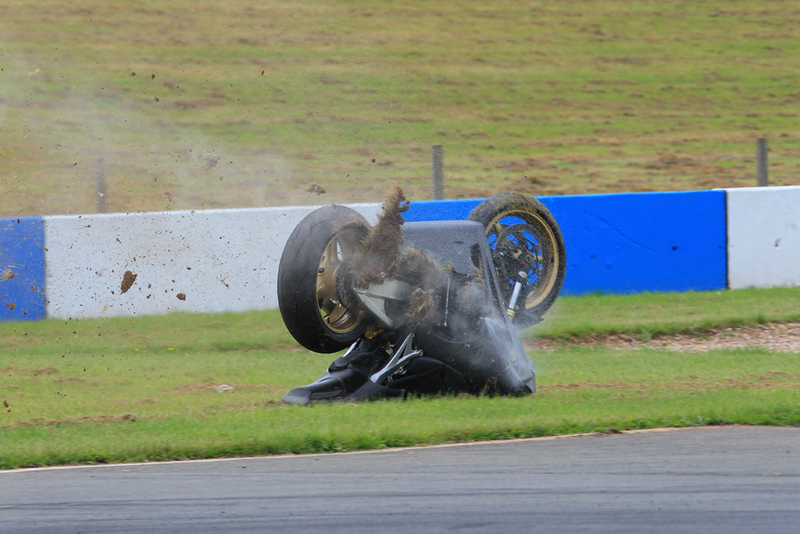 As for the bike, considering the tumble it took I’d say it got off lightly as well. Most of the damage ended up being smaller things. 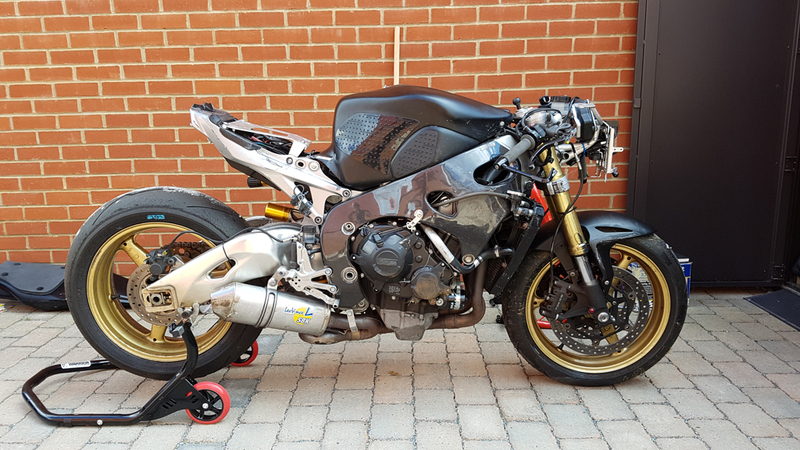 The biggest replacements were the tank, brake discs and fairings. I also had to have a small dent repaired on the front wheel rim. Aside from that everything else was things like clip-ons, levers and pegs etc. There’s no problems with the frame or the suspension and the engine starts up and runs just fine. So all in all, the aftermath wasn’t too bad. I would say the number one take-away is to simply give people more room. A close pass is fine until the rider you’re passing does something you don’t expect, or you simply misjudge the space you’re giving someone by a foot or two. Leave plenty of room and there shouldn’t be any problems in this regard. This is most important in the braking zone where options for manoeuvring out of danger are limited. 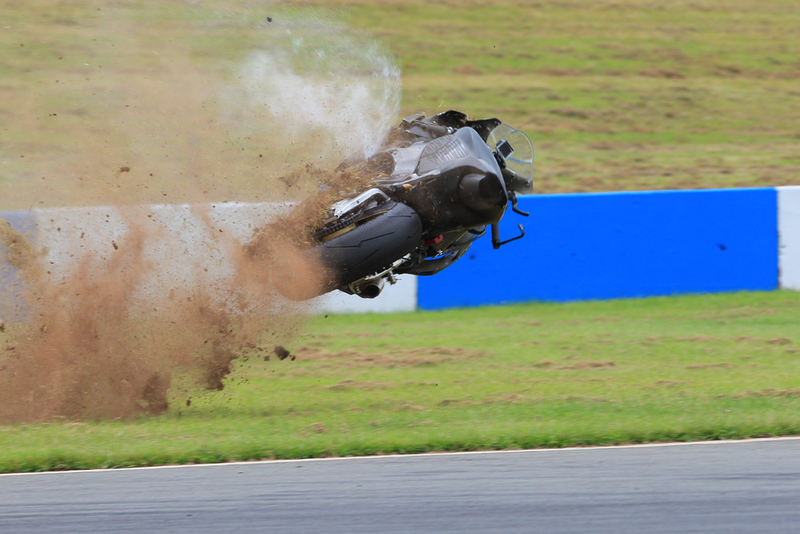 Moving across a rider’s path in the braking zone is not a good idea at all unless there is a large speed differential. Even then it's still questionable. As for me, I can see myself being more cautious around other riders because even though you can more-or-less predict what someone is going to do, it’s not always going to be what you expect. With the bike back together I can happily report that after spending a day at Brands Hatch recently it feels as sweet as it did pre-crash and everything appears to be ok. Unfortunately for the UK the track season is drawing to a close so I won’t get many more opportunities to ride. However, given the rate of the crash and the tumble the bike and I took, I’m grateful that I'll have those opportunities all the same. 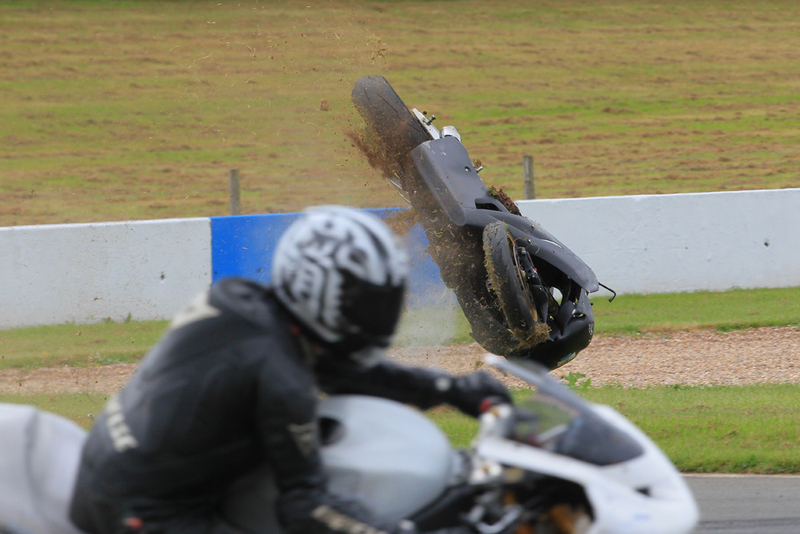 Crashing like this is never great, but all things considered I feel I've been a lucky boy indeed.